Mort(e) opens after most human beings on the planet have died. The Queen of the Ants has spent millennia planning for this eventuality, with her masterstroke coming in the form of a DNA upgrade for the planet’s animals, who gain sentience and strength before attacking their masters in a world-spanning conflict with no name. 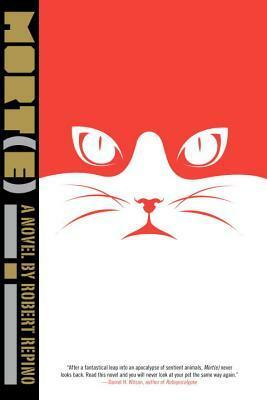 Mort(e), whose slave name when he was owned by the Martini family was Sebastian, is a grizzled war veteran, a special forces operative who served with a mostly-feline unit called the Red Sphinx. When human resistance to the animals and their insectoid benefactors has slowed to a crawl, Mort(e) and the surviving members of the Red Sphinx find themselves dealing with a legacy of the conflict, the dreaded human bioweapon EMSAH, which drives its hosts mad before they kill themselves. While most animals seem to have completely abandoned their old lives, content to move into their old masters’ homes and take their new marching orders from the Colony, there exists in Mort(e) one small flicker of his pre-uplifted existence: the beautiful memory of a brief period in his life, where a dog from next door named Sheba would come by and rest with him. When Mort(e) hears word that Sheba still lives, he sets out on a quest that will determine the course of his changed world. Robert Repino’s debut novel is pretty strange, as the above synopsis would suggest. It recalls the classic ’50s atomic monster movie Them! with a similar fixation on giant ants laying waste to things, as well as recent post-apocalypse stories like Cormac McCarthy’s The Road, Victor Gischler’s Go-Go Girls of the Apocalypse and Brian Francis Slattery’s wonderful Lost Everything. I’ve described it to friends and family over the past week a few ways, like “Milo and Otis meets Starship Troopers“, “Tom Perrotta’s The Secret of NIMH“, or “A Boy and His Dog, but the boy’s also a cat.” The book recalls the Fallout series of video games with the detailed way in which Repino has laid out his altered world history, and there’s also a dash of post World War II narratives where veterans find it difficult to re-integrate into society. I find that this review at Slate is a little bit out to lunch when it compares the book and its hero to classic detective fiction like Chandler and Hammett, as the tone is much more mournful and yet more bombastic somehow than that would suggest. Sure, there’s an element of mystery, and at one point our protagonist does take part in an investigation, but the book is far more concerned with exploring and subverting war narrative tropes and the guilt that plagues the victors of conflict, rather than any tired detective archetypes. Mort(e) is an interesting character at first, but I found him to become a little tiresome. While he can be construed as a white knight in the Chandler mould, as Slate notes, he’s also definitely not a detective. Given his background, and his relationship with superior officer Culdesac (a bobcat-turned-general, never tamed by humans before The Change), he’s closer in tone to a character like Snake Plissken, or for that matter Solid Snake or Big Boss (all the talk of genetic manipulation is also very reminiscent of the Metal Gear Solid series, too). What could be construed as hardboiled sangfroid is more like shell shock from a war that defies the imagination. Mort(e), whose name is a very roundabout reference to Le Morte d’Arthur, is single-minded in his quest to find Sheba, who represents a less complicated time, certainly one before he grew in size and started shooting people. While I appreciate the way in which Repino gets you into the mindset of an animal who only wants one thing, this and a later complaint made for some occasionally repetitive reading. There are a few references to that other book with talking animals who rise up against their masters, but these are mostly winking asides, albeit ones that raise the possibility that Orwell’s story might coincide with the world wide devastation caused by the Nameless War. The main philosophical thrust of the book comes as an argument between theism and atheism, and there lies most of my problem with the story. I loved the histories of this war, and I thought that Repino did an astounding job with the pre-uplift backstories of his animals. The writing has an amazing sense of how a creature that has not yet gained sentience might understand things like marital infidelity, mental illness, and general human cruelty. When the story shifts gears halfway through, when Mort(e) learns the secret of EMSAH, the endless bickering over whether or not God is real derails it for me. It feels like there was a definite axe to grind on this subject, and at times the narrative slows to a crawl as characters debate theology. It was interesting to note ways in which religion changes in a world where your dog probably did try to murder you, but I much preferred other parts of the story. Still, the sheer imagination on display in Mort(e) definitely makes it worth checking out. While I still had some questions about the scope of the whole thing by the end, the crazy fun action and affecting depiction of our animal friends is definitely worth celebrating. I listened to this book through Audible, and while Bronson Pinchot’s use of different sound effects and voices was pretty great, for general narration it sounded like he was on the verge of tears the entire time. It was a little bit distracting, although there are quite a few moments that made me tear up too. This might not be a book for animal lovers, although it might appeal to those who wonder what their cat gets up to while they’re away.